Our most popular spray gun has had a colour infusion. The Hozelock Seasons range is fun, vibrant and will brighten up even the gloomiest of gardens. Making it the perfect companion for the season ahead. The Hozelock Seasons range comes in three fantastic colours: Purple, Pink and Lime Green. 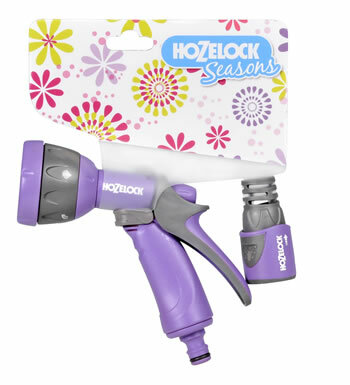 Made from high quality materials, this Hozelock Multi Spray gun comes with a quick connect male connector to allow fast changing between attachments making garden watering hassle free. High definition metal rose for gentle watering. It also has a lockable rear soft touch trigger with flow control. It is pressure sensitive, as water can be controlled between 0 and 100% and locked at 40% and 100% saving you up to 50% of water wastage.